I have a slide that has two layers, each layer has a Hotspot and each Hotspot has a trigger for if the user clicks the Hotspot and for if the user clicks outside the Hotspot. 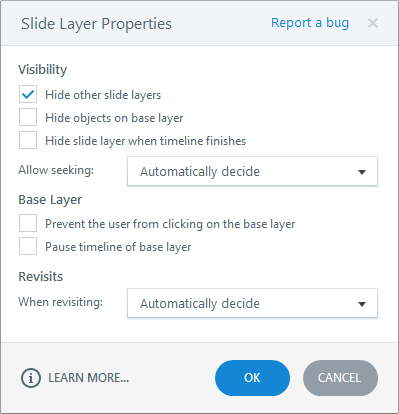 When the user is on layer one and clicks outside the Hotspot on layer one, Storyline appears to also see that as a click outside the Hotspot on layer two well (which in the strictest sense, it is) and executes the click outside trigger for that Hotspot also. I have worked around this issue by creating variables and conditions for my click outside triggers but this adds complexity. Therefore, I would like it better if the click outside triggers were consigned to their respective layers. Is there a setting somewhere that I am missing? Or will I need to continue to use variables and conditions for this click outside triggers? Do you have the layer properties set to hide other slide layers? If you need us to take a look, feel free to share your .story file. Workaround for "clicks outside hotspot"